Drug therapy is a critical part of the medical management of patients with renal impairment and those requiring renal replacement therapy (renal dialysis or kidney transplantation). Not only are drugs used to prevent and treat a wide range of renal diseases and their complications, but they are also required to manage a variety of complex co-morbidities commonly seen in these patient populations. Drug use in patients with renal impairment and transplantation can be complex because of the important role the kidneys have in the excretion of endogenous and exogenous compounds. Impaired renal function can result in significantly altered drug pharmacokinetics and pharmacodynamics and as a consequence, such patients are at a significantly higher risk of developing adverse effects due to drug accumulation and/or significant drug interactions. When prescribing drugs for patients with renal impairment or transplantation, it is important that clinicians and healthcare professionals consider these changes and make suitable modifications in drug prescribing so as to avoid serious and predictable adverse effects and maximise therapeutic benefits. Often, concise, accurate and reliable information on drug dosing in patients with renal impairment and transplantation is not readily available to clinicians and healthcare professionals. 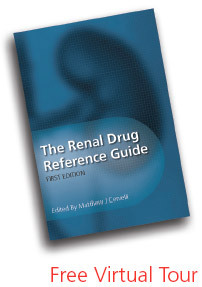 ‘The Renal Drug Reference Guide’ is an independent and comprehensive publication on the use of drugs in patients with renal impairment and transplantation. This resource was developed by a team of specialist pharmacists and clinicians with the intent of producing a concise, reliable and clinically based information reference to guide and assist medical practitioners, pharmacists and other healthcare professionals in the decision making process of prescribing drugs in patients with renal impairment and kidney transplantation. We believe this resource is an essential tool for specialist clinicians and pharmacists with direct responsibility for patients with renal disease and transplantation and that it will also find valuable application in the primary care setting for practitioners who attend to patients with kidney disease and transplantation. In making this resource available to the medical community we seek to promote the appropriate use of medicines in these patients populations.